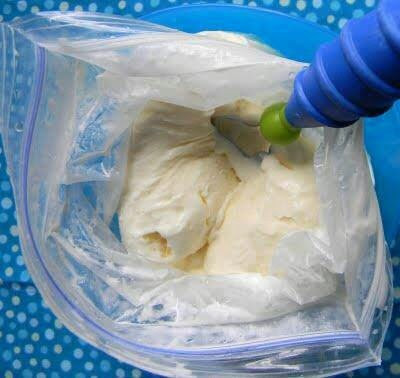 This past summer I read on several blogs and websites how to make ice cream in a bag. I really wanted to try it with my my cousin's kids but never had the chance for one reason or another. A few weeks ago, though, I was sitting for them over a long weekend and we tried it one night. OMG is it ever fun! It would be a hoot to make even if you have friends (adult friends that is) over for a casual dinner in the back yard, too. 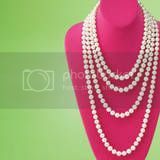 Sooo easy and really just good clean fun....in a bag. 2. Place the salt and ice in the gallon-size bag, then place the sealed smaller bag inside as well. Seal the larger bag. Now shake the bags until the mixture hardens (about 5 minutes). Feel the small bag to determine when it's done. 3. Take the smaller bag out of the larger one, add mix-ins, and eat the ice cream right out of the bag. Easy cleanup too! Serves 1. So I was wondering after I made it with the boys (and forgot to take a picture- sorry! ), if it might be tasty with other flavorings. So of course when I went home that week I made it by myself (that's right, not a kid in sight!) with a dash of lemon extract. I made it this week once with a dash of almond extract. All are delish- the lemon is my favorite of the three. Oh, when I made it at home I used fat free half and half (don't get me started on how I think this product is misnamed. Half and half? It's fat free so I'm pretty sure "none and none" is a more fitting name. But I digress....). So not only is it super yummy, but fat free too! Give it a try, friends. Try it with your kids or without and just feel like a kid. Have you every made ice cream in a bag? Would you ever consider doing it with your adult friends, even if kids aren't around? Any fun flavor ideas that I should try this summer? Oh I am long out of college and I have made it twice by myself so I think you are all good to give it a try. Seriously so fun and easy! This sounds like fun. I'll have to give it a try!